The classic Russian poet Alexander Pushkin died fighting a duel 179 years ago on February 10. To commemorate the tragic date on which he lost his life in a matter of honour, we look at five of the best-known duels involving Russian writers. Alexander Pushkin, Russia’s greatest poet, was a man of violent temperament who, by the age of 37, he had been involved in at least 15 incidents related to duelling, three of which actually ended in fighting. Pushkin was known to fight duels over jocular poems, quarrels at balls or at the gaming table, but his duel with George D'Anthès, a French nobleman serving in Russia, was in a fit of jealousy. Pushkin was angered by jealousy after D'Anthès courted his young wife, considered one of the most beautiful women at the imperial court in St. Petersburg. As it turned out, Pushkin’s jealousy was not unprovoked: his wife Natalya Goncharova was indeed smitten by D'Anthès. Pushkin challenged the Frenchman: The duel took place to the north of St. Petersburg, on the Chernaya Rechka (the Black River), the opponents slated to shoot at each other at a distance of 20 paces. D'Anthès was the first to shoot and his bullet hit Pushkin in the stomach. Falling into the snow, Pushkin fired his pistol and seeing his opponent fall too, cried out: “Bravo!” The wound D'Anthès received turned out to be light, whereas Pushkin died from his wounds two days later. Mikhail Lermontov, another well-known Russian poet of the 19th century, and Nikolai Martynov were fellow officers fighting in Chechnya and Dagestan. In the summer of 1841, while in the North Caucasus city of Pyatigorsk, both were courting Emilia, daughter of General Verzilin. While chatting to her in the general’s house one day, Lermontov cracked a few jokes about Martynov. A quarrel ensued and a day later, the two fellow officers decided to fight a duel. After the first countdown, neither fired his pistol, after which one of the seconds cried: “Shoot or I shall cancel this duel!” To which Lermontov replied: “I am not going to shoot at this fool!” “I got angry,” Martynov later wrote in his account to the investigator, “and pulled the trigger.” A couple of minutes later Lermontov lay dead. Kondraty Ryleyev, a poet who took part in the Decembrist Revolt of 1825, defended the honour of his illegitimate stepsister Anna, who was being amorously pursued by 19-year-old Prince Konstantin Shakhovskoi. Having decided that the young man’s intentions were not honourable, Ryleyev challenged Shakhovskoi to a duel. However, the latter refused to fight until Ryleyev spat him in the face in public. The duel was very tough: There were no “points” marking the distance at which the opponents were to shoot at each other and the two men, who fired their pistols simultaneously at their seconds’ signal from a distance of just three meters, twice hit each other’s weapons. One of the bullets wounded Ryleyev in his foot. Alexander Griboyedov, author of the well-known comedy ‘Woe from Wit’, was involved in a type of duel in which the ‘seconds’ also fought each other. The original quarrel was caused by ballet dancer Avdotya Istomina, whose attentions were sought after by two young counts, Vasily Sheremetyev and Alexander Zavadovsky. A challenge followed, and Zavadovsky mortally wounded Sheremetyev, after which the latter’s second, Yakubovich, took out a bullet, showed it to Griboyedov, who was Zavadovsky’s second, and said: “This one is for you.” The seconds’ duel was postponed and took place a year later. Griboyedov missed, while Yakubovich wounded him in the hand. From then on the writer wore a special pad on his injured little finger and it was by that injured finger that his mutilated body was identified in 1829: Griboyedov was killed when an angry mob attacked the Russian embassy in Tehran. Nikolai Gumilyov and Maximilian Voloshin, both poets of the Russian Silver Age, fought a duel over another poet, Lilya Dmitriyeva. She had rejected Gumilyov and he made some insulting remarks about her. Voloshin stepped in to defend the lady’s honour. 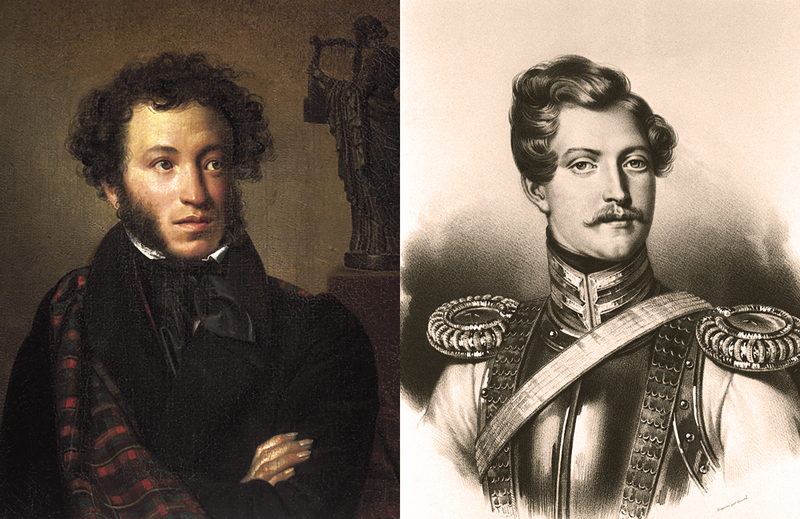 The two poets held their duel on the Chernaya Rechka using Pushkin-era pistols. On his way to the venue, Voloshin lost one of his galoshes and declared that he would not leave the spot until he found it. The galosh was found. Gumilyov fired his pistol first and missed, while Voloshin’s pistol misfired twice. The two poets finally made up and resumed their relations after a gap of 12 years.